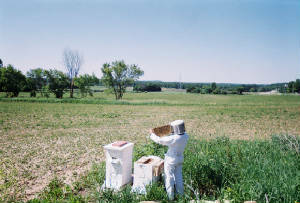 The Milwaukee Waukesha Beekeepers Association. 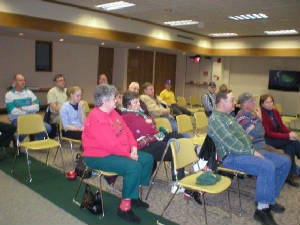 The MWBA is a group dedicated to assisting with networking, starting new beekeepers and having fun. These photographs represent some of the general activities. This represents the typical membership of the association. 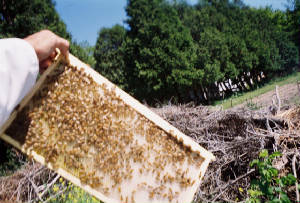 All beekeepers and people interested in Apiculture. 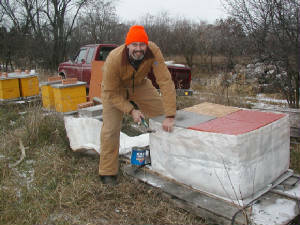 Some beekeepers wrap the hives with special insulation for the winter, to help the bees conserve energy and honey. Jerrel Thomas is in his back yard, working on a beehive. Two young beekeepers working on a beehive. 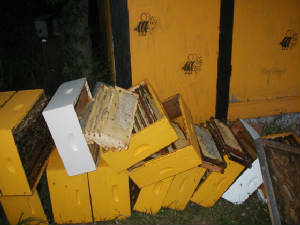 The hives fell over, because a beekeeper didn't have a strong stand under them. Normally never happens. Except to Andy. These honeybees are starting to work on the plastic frame, adding beeswax to form the honeycomb needed to raise baby bees, and to store up honey and pollen. . 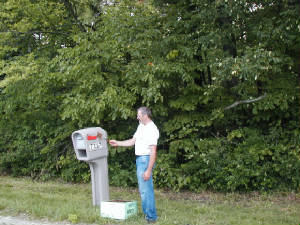 Removing a small swarm of honeybees from a mailbox. 97 year old Cliff Hendriks (center) is showing two new beekeepers how to take honey supers off of beehives at the end of summer. 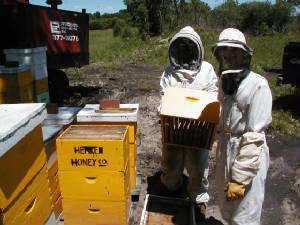 The hives are "smoked" to distract the bees, and fume boards used to drive the bees out of the honey supers. The supers can then be loaded onto the truck for the trip to the honey house. Martin is cutting the beeswax caps off of the honeycomb with an electric hot knife. 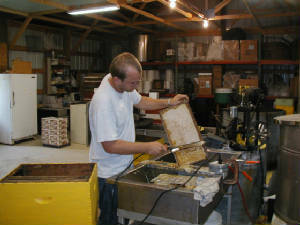 Each frame is placed in an extractor (centerfuge) where the honey is spun out of the comb. The frames are then placed back in the honey supers for use next year. 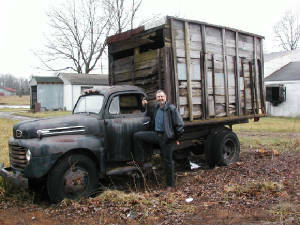 Some beekeeping trucks are older than others.